We reviewed dozens of kids dressers to identify the best of the best. We looked at dressers that would last your child his whole life and those that will fit his childhood themed room. We found the dressers that will move easily and those that are part of a collection and will coordinate with other pieces. No matter what kind of dresser you need, there will be something for you on our list. The Delta Children Haven 6 Drawer Dresser really has all you’ll need for your child’s room and then some. Early in our research, we determined that the Delta Children Haven 6 Drawer Dresser was the obvious choice for our top pick. As part of possibly the most popular brand of small children’s furniture, there’s every possibility that you already have other pieces of this brand in your child’s room and each piece is made with high enough quality that you won’t regret its purchase. The Delta Children Haven 6 Drawer Dresser would be a perfect convertible dresser to changing table with a simple topper addition. While you’ll need to purchase this separately, it is absolutely designed to do so – and then back again. This dresser is part of a collection specifically created for a child’s room and it will transition with your child as she ages from infant to toddler to school aged and beyond. It’s designed for a maximum durability and efficiency with solid wood in some places and wood composite in other places. Each drawer has smooth gliders with safety stops that will allow you easy access and help your little one be able to use it without hurting himself. It meets or exceeds all ASTM standards so you can expect it will not be the cause of any injury, which is always nice to know about anything in your child’s room. With an overall rating on Amazon of 4.1 stars, earned by nearly 200 customer reviews, you can be confident in this purchase. Not only will you likely be satisfied with the quality of the dresser, you’ll also be pleased with how much you’re getting for just $210. If you’re in the market for a chest of drawers style dresser for your child’s room, look no further than the Stork Craft Kenton 5 Drawer Universal Dresser. 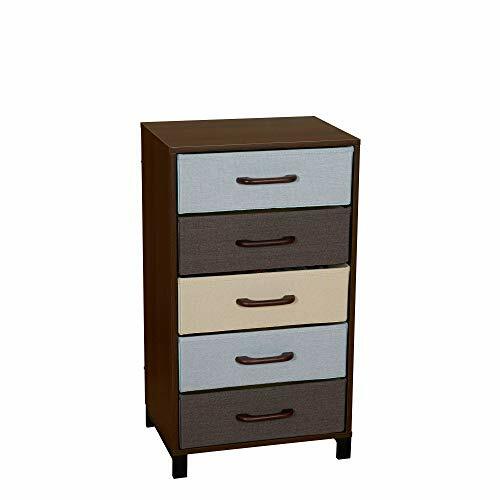 The Stork Craft Kenton 5 Drawer Universal Dresser is a chest of drawers style dresser that you’ll be able to secure to a wall and use as your child’s primary dresser. It has a high quality appearance that will easily fit any child’s decor. It also meets or exceeds all ASTM standards worldwide so adding this dresser to your home won’t put your children at any greater risk. This dresser is constructed with a durable cherry wood that will ensure it lasts your child for the entirety of her life in your home and beyond (that is, if you want to give it up when she moves out!) It has a nontoxic finish so you won’t need to worry about your teething child nom-ing on it before you can get to her to stop her and the hardware finishes are all a durable steel construction. 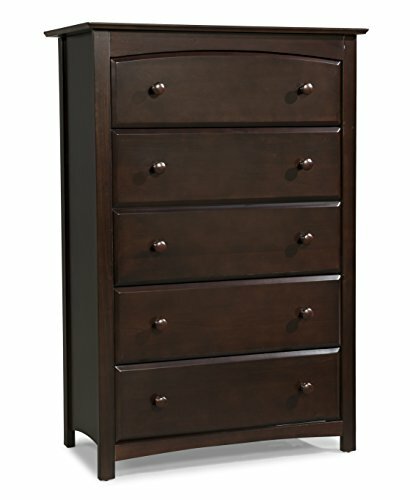 There are over 250 customer reviews on Amazon earning this dresser a more than respectable overall rating of 4.2 stars. These numbers are certainly enough to invoke confidence in the purchase and in your satisfaction. For a dresser that will get the job done without breaking your budget, pick up the Household Essentials Wooden 5 Drawer Dresser. The Household Essentials Wooden 5 Drawer Dresser will easily store all the clothes your little one needs. There are five drawers in this chest of drawers style and each are functional and polyester fabric drawers. It’s lightweight, only 16 pounds, and therefore easily moved (still anchor it) and not easily climbed by your little monkey. The frame is a manufactured wood with veneer and the back, frame, and feet are all a high quality steel or wire construction, keeping the drawers securely in place and easily pulled and pushed in and out. You may not be able to use this dresser as a convertible from dresser to changing table and back, but it will compliment a changing table perfectly and for the options of coordinating pieces, you may find this is an ideal dresser to start your child’s “grown up” room. And, should he opt to leave it behind after he moves out, you’ll be able to re-purpose it for your own use; as a dresser, or storage of any kind. While the ratings and number of customer reviews are impressive (4.4 stars on Amazon with close to 200 reviews), it’s the price that’s the number you’re really going to love. You’ll be able to pick up this dresser for under $65! For a classy addition to your daughter’s room that will coordinate with the decor perfectly, try the mDesign Wide Dresser 5 Drawers Storage Furniture. 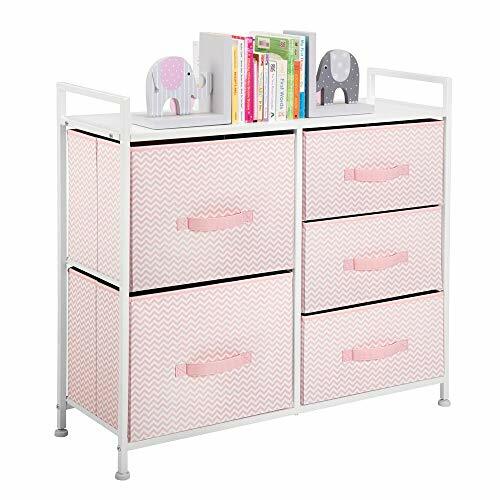 The mDesign Wide Dresser 5 Drawers Storage Furniture comes in a dainty pink that will fit your little girl’s room beautifully. There are 3 colors to choose from, so it won’t only work for a girl’s room, but with the pink chevron pattern, we have to admit we like it best for a girl’s theme. Each drawer is a collapsible fabric that will pull out and push in easily for you or your daughter, either one. The metal frame makes the dresser durable while still maintaining the lightweight design that the fabric boxes enable. You’ll be able to fill each box or drawer with clothing or plush toys easily. You won’t be able to use this as a changing table due to weight restrictions but you can use this for all your baby’s necessities, diapers, wipes burp clothes and plushies until she needs the drawers for her clothes, making this a dresser that can be used for years and years. With an overall rating of 4.2 stars and nearly 100 customer reviews, it’s logical to assume you would be just as satisfied with this dresser as the other customers who’ve purchased it. 82% of the people who’ve rated it have given positive feedback and that’s definitely encouraging. 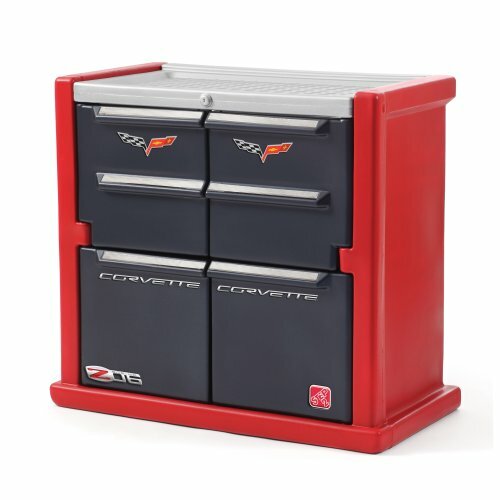 For the sports car lover in your life, pick up the Step2 Corvette Dresser for Kids – Durable 4 Drawer Cabinet Organizer. The Step2 Corvette Dresser for Kids – Durable 4 Drawer Cabinet Organizer is a perfect place to put your child’s big, bulky clothing. We quite like the idea of folded sweatshirts that will pull if hung up and take entirely too much room folded in a traditional drawer. It would, of course, also be excellent used as a standard dresser, just without the drawers (which, if we’re honest, often cause trouble by being pulled out and turned into steps). Because this dresser style will allow you to organize all sorts of contents, your child won’t be limited to just clothing storage. If you (or he) chooses, this would also make an excellent place to put a few cube bins that will organize and contain the chaos of his matchbox car collection – or anything you want organized but still “put away” behind closed doors. There are well over 100 customer reviews on Amazon for this dresser, awarding it an overall 4.0 star rating; which is certainly nothing at which to scoff. Those numbers and their reviews suggest you (and your child) will be well pleased with this product. You likely understand a need for your own dresser and for your newborn’s changing table but for the teeny tiny clothing of your child you may not see the need for a dresser straight away. After all, all her clothing will easily fit hung up in the closet she already has in her room, so why add complications to a room already muddied with extra furniture? The truth is, though, that the need for a dresser will be there whether you see it at first or not; and the older your child gets, the more crucial it will be for his and your sanity. Your organization may be meticulous, but without a dresser, the room can never really be efficiently organized. The bigger your child becomes, the bigger his clothes and the less likely they are to all fit in bins on the changing table or hanging in the closet. So who should buy a kid dresser? Anyone with a kid. Even if you decide to buy a temporary fix for the clothing situation (like totes, for example), figuring when he gets old enough you’ll be able to get his input on what he really wants, you’ll still need to get some kind of a dresser in the meantime. Finding something to help him when you’re running late will be invaluable. Because when you have a child or children, it can sometimes feel like you’re always running late. Being able to just open a drawer, pick out any random pair of pants, another drawer for a shirt and another for underwear and socks is extremely useful during these times, especially. If you’re furnishing your child’s room, you’ll also want to check out our reviews of the best kids desks and the best kids bookcases. Armoire dressers. Some of your little one’s clothing will need to be hung in order to avoid wrinkles or damage; particularly those little dresses or suits. While he may already have a closet that will meet this need, if you’re pressed for space or you want to have all of his clothes in the same spot, an armoire can solve that problem. Just like for adults, a kid’s armoire will likely have drawers and a rod for hangers and those more delicate clothes. Multi-purpose. Your child will always need a dresser, no matter his age. He may not always need the toy bin that comes along the bottom of some, though. However, if toys are an immediate concern that you feel you need to tackle, then you may want to get that chest of dressers with storage bins, too. And keep in mind that just because toys are what you’re buying it for when he’s young, that doesn’t mean he won’t be able to use the bins later for linens, books, or shoes. Construction material. You’ll need to weigh the pros and cons of each construction type. Wood is the most traditional and it is incredibly durable. If you purchase a high quality, solid wood (rather than engineered wood) dresser, you can expect that dresser to last your child the rest of her life. However, it’ll probably be your most expensive option. And your small children run a risk of marking, drawing, staining, or ruining its appearance in some other way. Not to mention wood is the heaviest material, which will make moving it harder, too. A high quality engineered wood will last nearly as long and be a fraction of the weight and cost, but it will break and split over time. In fact, each time you move it, you’re likely decreasing it’s life. A fabric or plastic construction will cost the least and move the easiest, but will be able to take less of a beating than the others. Mounting. Always, always, always secure your child’s dresser to the wall. Children tend to be curious creatures and young children in particular will climb on anything to satisfy that curiosity. And dressers are heavy. Unfortunately, they’re not usually heavy enough to prevent tipping over if a child is climbing on the front and even worse, they are heavy enough to crush that child. Preventing this should be your number one priority in set-up and assembly of a dresser; it could save your child’s life. What is the standard size of a dresser? For a dresser that will most likely come in two columns of drawers and commonly with a mirror along the top, the height will need to be fairly low; waist high for an adult at most. That, too, is a varied number depending on your height, but for a child you may want to opt for the smaller side. Standard dressers range from about 30-44 inches in height (most are on the lower side anyways) while the width and depth is usually 60 inches and 20 inches, respectively. While there is less of a standard for a chest of drawers, there is an overall expectation that the term implies a taller dresser. They’ll commonly be 38 inches or less wide, and their height will be either 36, 42, or 48 inches. These are the most common measurements because, depending on the wood purchased, that’s the size in which sheets of wood are cut and sold. Keeping to those same measurements for construction will save the manufacturer on waste. Are kids dressers smaller than the standard size? These will most often be dressers and not chests of drawers in style;if for no other reason, because higher drawers are harder to reach for little ones. If you do find a “children’s” dresser that happens to be a chest of drawers, it will more likely be a short chest. It’s also very common for a children’s furniture to come in a collection of other “children” furniture: IE a crib, toy box, or toddler bed. How do you measure a space for a kids dresser? As with most of these types of questions, the answer to how to measure the space for a dresser is, “It depends.” The biggest determiners are how old your child is when you get the dresser and what you plan on using it for. That is, if you plan on using it as a changing table before graduating it to a full dresser, then you’ll need a space wide enough for your little one to stretch out on up to roughly age three. If your little one has a lot of clothes or you plan on keeping diapers on a caddy attached to the side, then you’ll want to leave a fair amount of space on the side. How do you anchor a dresser? You may not plan for your little one to climb on his furniture (and we never do) but the reality is that they very likely will try it. Hopefully you can catch and correct that behavior immediately but on the [common] chance that you don’t get that opportunity right away, you’ll need to thoroughly child proof that dresser. When he is a newborn, you may not need to worry, but the second he starts moving and shaking anchoring the dresser is vital to his safety. Unfortunately, this means you’re going to need to put a few holes in the walls and dresser. (A little drywall/wood putty and paint is a small price to pay for your child’s safety, though.) You’ll need to anchor the dresser with a heavy duty L-bracket or purchase straps that are specifically designed to keep the dresser from falling. The danger is just simply too great to risk; Pick straps or brackets for cheap and possibly save your child’s life. You’ll need to have 2 straps or brackets for each piece of furniture; one on each side is the only way to ensure the stability. The anchor should be secured to something solid on either side. That means a wall stud in the drywall and solid wood on the dresser. (If your dresser is engineered wood, you may need to improvise and secure it to the strongest part of the dresser; either the thicker corner or top surface. Make sure it’s secured tightly that means the straps are taut and the screws in the brackets are as tight as possible. And check these regularly to make sure they don’t loosen over time. We looked at 20 other dressers for kids. Even though they didn’t make our 5 best kids dressers list, they’re the best of the rest and each is still a great option for your child. The information you’ll need to compare each one is included with the listing. This classy dresser is a low chest style that your little one can use for her night stand later in life, while you use it as a changing table in her infancy. This chest of drawers style has a cubby along the bottom for toys or whatever your child decides. 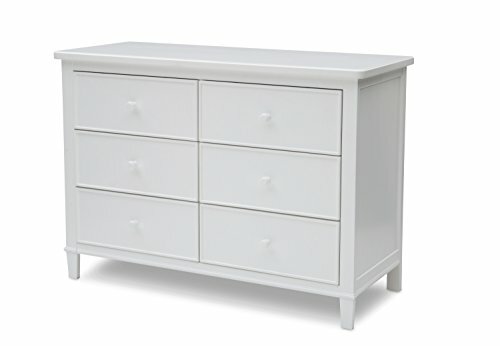 This dresser will be the easiest for you to put together; in fact it comes shipped fully assembled. This dresser is part of a collection, so you’ll be able to purchase it and a crib or topper that will convert it into a changing table without any worries of coordination. Each drawer of this dresser has a weight limit of 45 pounds, so you’ll easily be able to fit all your little one’s items. While you should still anchor this dresser, it does meet he safety requirements of the U.S. voluntary industry tip over standard. With purchase of an additional topper, you’ll easily be able to convert this dresser into a changing table and back again when they outgrow that need. This dresser is part of a collection that will allow you to coordinate your child’s room from crib to twin bed, changing tray and nightstands. This mirror is attached to a dresser that will last long enough that your toddler will check to see what color his tongue is after a Popsicle and later, your teen will check to see if his hair is in place before a big dance. This dresser is part of a collection that will offer a brass touch to a sturdy wood for a classy feel. This dresser features metal runners and safety stops so your little one won’t slam his drawers and make a mess of his clothes. The drawers of this dresser are protected by full extension gliders and safety stops. You can easily convert this dresser into a changing table and back with an additional purchase of a topper. You’ll be able to customize this dresser for your little one with the photo inserts on the front of each drawer. These fabric bins are easy to slide in and out which should help your little one put her own clothes away when the time comes. With the two armoire style sections of this dresser, your child will easily be able to store his more fragile clothing hung up rather than folded. The fabric drawers will easily store your kid’s clothing and the shelf along the top will store anything from books to diapers. This dresser is the perfect coordinating piece for the child who is obsessed with race cars.